Please include a description of your entry and a brief summary of your organization and its accomplishments so that we may correctly recognize your organization in the parade. -Parade entry fee is $25 for all entries. 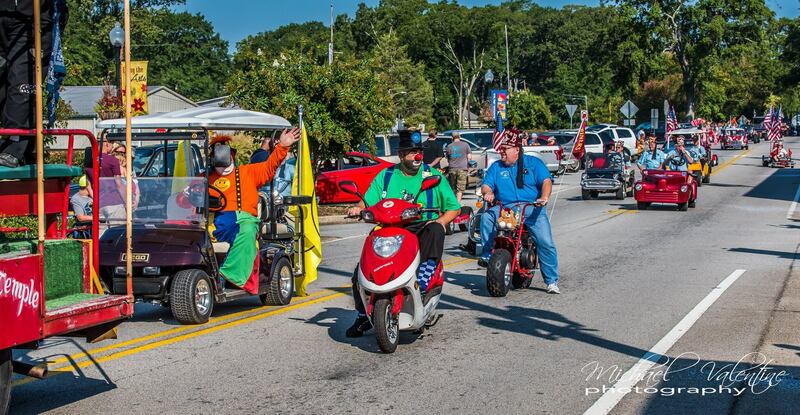 There is a separate $25 fee for each walking group, vehicle or float entered in the parade. -A completed application should be submitted no later than August 31st. -A parade Position Number will be assigned and emailed to you by September 6th. If your entry is not accepted you will be informed via email. -You will receive your Parade Number via email. Your Parade Number must be displayed on the left front of your entry. This includes floats, walking groups and marching units. -Limit one (1) vehicle and/or float per entry. There is a separate $25 fee for each walking group, vehicle, or float entered in the parade. -No riding on the roof of any vehicle, truck-bed fender walls, top of truck cab or sides of truck beds. -Two adult spotters are required for floats, trailers or trucks. -Parade entrants must refrain from throwing items from any vehicle. Entrants may hand out candy ONLY. -All vehicles, floats and walking groups are to remain at least 20-25 feet behind the parade entry in front of them.